← Life should be fun, shouldn’t it? The hunting season is upon us again. And again, we feel under siege. There was a single hunter patrolling the perimeter of our fence, and three dogs running around our land – how did they get in? Did he cut the fence? Two years ago we did have three men open our gate and start walking down our path, guns at the ready, as though they owned the place. Joe confronted them and they reluctantly withdrew. Brave him! The big game season runs from October to November and this includes wild boar, mountain goat, various species of deer, ibex, roebuck and chamois. Apparently all game is strictly defined and there are large fines for anyone caught hunting out of season, although I do wonder who would tell on whom if some wild boar sow managed to get herself shot while these lunatics are on the loose for the remainder of the hunting season which, for small game, goes on until early February. Small game includes grouse, quail, ring dove, turtle dove, red-legged partridge, pheasant, pigeon, hare and rabbit. The Spanish kill thousands of songbirds each year, which are considered a delicacy and are, unfortunately, unprotected. 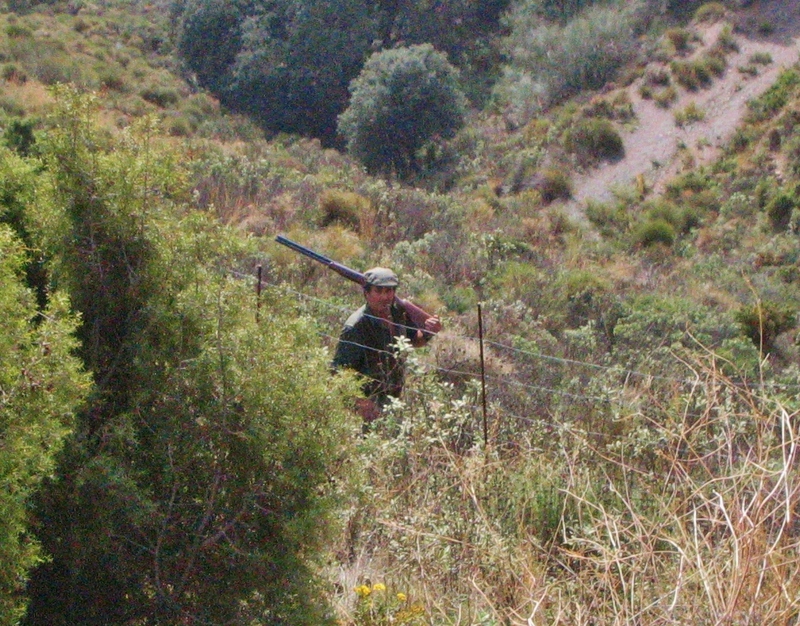 There’s no tradition of conservation in Spain and most hunters are inclined to shoot anything that moves. One article said; “although hunters won’t deliberately shoot, it’s advisable to steer clear of the countryside during the hunting season…”. A bit difficult when you live on the edge of the Parque Natural and men like these fine specimens walk within metres of our boundary like a band of outlaws from the wild west, guns usually over shoulders, listening and waiting and taking the occasional long glance down at our humble little home. 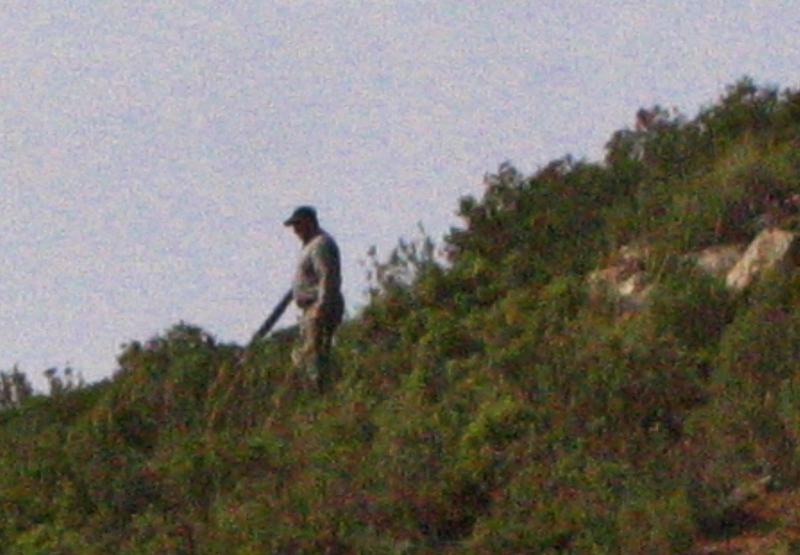 I noticed there was a group of some 30 walkers beneath us in the valley by the ruined finca, only a few hundred metres from where these predators had congregated and had started firing. Difficult situation for Brits in Spain. 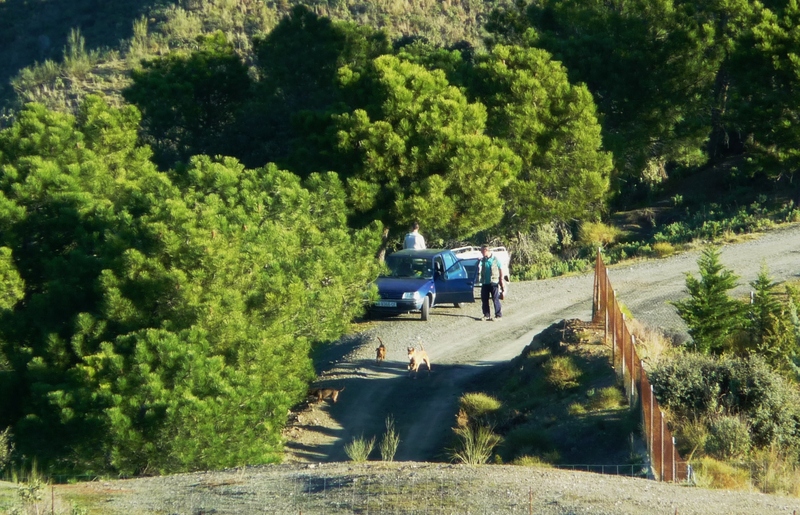 Do they simply accept the Spanish hunting tradition, or do they try to do something to protect the animals? Each ex-pat or part-time resident needs to make up his or her mind on this one. I tend towards believing that “when in Rome, do as the Romans”. Very difficult situation for us Brits living in an alien culture to ours. But they are ingrained in these practices and simply have no concept that it is unacceptable in this modern, enlightened world. I suppose you could call me a coward for just meekly handing the dog back to the owner, while criticising hunting behind his back, as it were. @ jbfoggy ……… While I respect your right to your opinion; No change can ever happen in the world unless existing practices are challenged and healthier mindsets towards all life and the betterment of the planet are promoted and supported. Ignorance not only tolerates, but is the parent of all wrongdoing. Foggiebabe on Solar, so good? Anna Tinline on Solar, so good?